The black settlement at Oro was not, as oral tradition would have it, a northern terminus of the “Underground Railroad.” In fact, it was the result of government policy to settle Loyalist black refugees, who may have been escaped slaves, free men, or veterans of the War of 1812. The outbreak of the war caused apprehension among black settlers in Upper Canada, who feared an American victory might bring a return to slavery. As a result, free blacks, and many escaped slaves, volunteered to fight for the British. One noted militia unit was Captain Runchey’s Company for Coloured Men, which saw action at Stoney Creek, Queenston Heights, Lundy’s Lane, and St. David’s. Veterans of Runchey’s Company were among the black settlers in Oro. 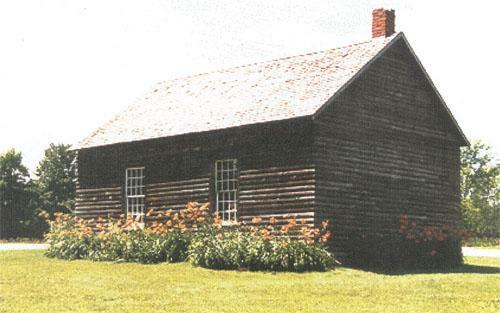 Between 1819 and 1831, black settlement along Wilberforce Street, located along the west side of Concession II in Oro Township, was sponsored by the government of Upper Canada. Though it was not the largest black settlement in Upper Canada, the Wilberforce Street settlement was the only one that resulted from government planning and encouragement. The Wilberforce Street lots, as well as some in Concessions III to VI, became home to about 60 black settlers and their families, with a maximum population of approximately 100 people. Settlement occurred in two waves, from 1819-1826 and from 1828-1831.
corner of Conc. 3 and side road 10/11. Arriving as early as they did, the black families who settled along Wilberforce Street were among the first permanent agricultural settlers in the area. 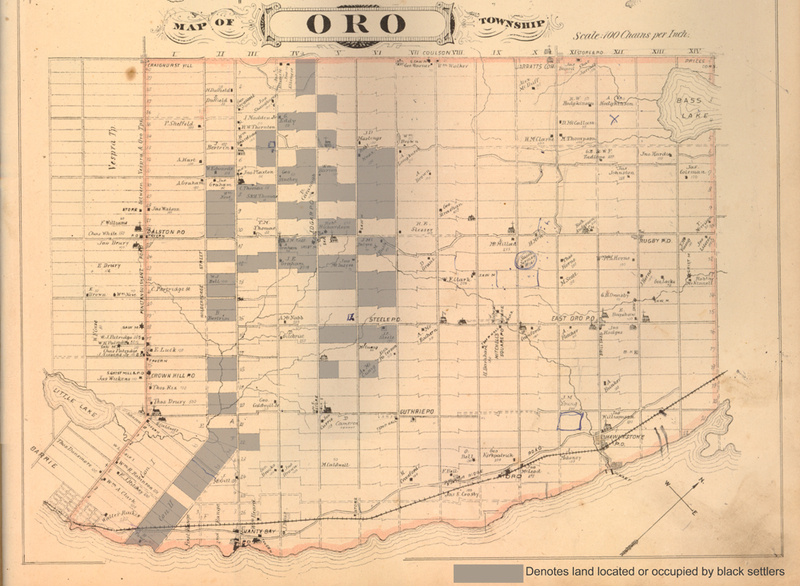 The very first will probated in Simcoe County, in 1841, was that of George A. Darkman, who was granted Lot 24 Concession II, Oro Township. Descendants of some of the first black settlers remained in Oro for nearly 130 years, and in other parts of Simcoe County to the present day. Until 1819, there was no European agricultural settlement in Simcoe County, though there were established trading, missionary, and military settlements. The years preceding the War of 1812 had seen the situation of military outposts at Nottawasaga and Penetanguishene to guard against American attack from Lake Huron. In 1808, it was deemed crucial to have a land route to the settlement at Penetanguishene. Samuel Wilmot was dispatched to explore and survey a road from Kempenfelt Bay to Penetanguishene. It is possible that one of the earliest black settlers in Oro, Daniel Cokely, worked for him on this expedition. On April 26th, 1819, under Lieutenant-Governor Peregrine Maitland, the Executive Council, two members of which had been slave-owners themselves, created a policy of settling black Loyalist veterans and refugees on 100 acre lots in the second concession of Oro Township. On that date, four orders-in-council were passed granting land to black settlers. It appears that none of these four grantees actually settled on Wilberforce Street. Between 1819 and 1826, about 23 orders-in-council were issued. The recipients of these grants were a disparate group, mostly labourers who had emigrated from the United States. Eleven of the men who settled along Wilberforce Street had served in the military during the War of 1812. Of the others, eight were living in Upper Canada during the War. Only 19 actually applied for a location ticket, and only eight of these actually settled their lots. It is unknown where the absentee settlers were, though some may have lived in Toronto or the Niagara region. In 1825, the regulations pertaining to land distribution were changed, making free grants available only to Loyalists and those with military service. All others had to pay for the rights to settle. In 1827, Peter Robinson (a former slave owner) was appointed Commissioner of Crown Lands, which position was responsible for the settlement of black veterans and Loyalists in Oro Township. During this time, repressive laws in Ohio led to an exodus of black persons out of Ohio and into Upper Canada. Many settled in Middlesex County, while others established themselves in other areas of the province. It is believed that some of those who settled in Oro during the second wave were refugees from Ohio who initially located in southwest Upper Canada. Groups of black refugees petitioned the government to buy or be granted large parcels of land for settlement, but pressure from local white settlers, along with the government’s decision to provide land to black settlers along Wilberforce Street, led to the rejection of these “group” petitions. This was not discriminatory, but was rather a rejection of any special treatment. Blacks and whites were equally welcome to petition the government – as individuals – for land grants. Under the direction of Commissioner Peter Robinson, land was sold to black settlers at one shilling per acre. Payment was not required until the patent was issued, after all improvements were complete. In most respects, land distribution to black settlers remained the same. One crucial difference was that Robinson settled many off of Wilberforce Street, on Concessions III to VI. Thirty-nine orders-in-council were issued by his office.